It’s time for this month’s Fantastical Food Fight, hosted by Sarah at a Fantastical Sharing of Recipes! This month, the theme is rum! You guys, I have made so many rum based cocktails this summer (Frozen Banana Daiquiri, Mermaid Martini, & Dark Mojito), I was fresh out of ideas for this one! Then I did my Coffee-Infused Butter experiment (oh yes, you definitely need to click that link & check it out – Science!) and I knew right away that the coffee-infused butter and resulting buttermilk were destined to become Tiramisu Cupcakes and Coffee Cream Cheese Frosting – yaaaassss! 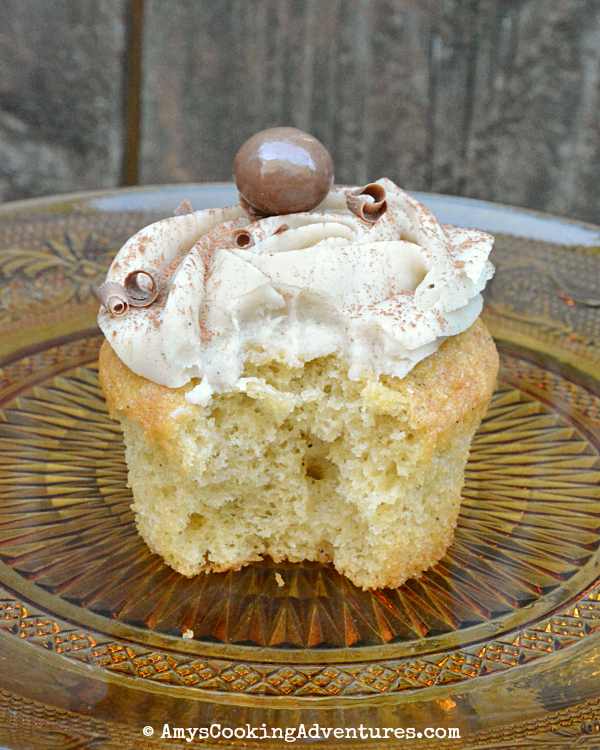 The coffee-infused butter launches these cupcakes to the next level. They’re intensely coffee flavored while not being overwhelming. Mix all of the cupcake ingredients in the bowl of a stand mixer until smooth. Divide the batter evenly between the liners and bake for 25-28 minutes. Once the cupcakes are cooled, make the frosting by beating together the cream cheese and butter until very smooth. Mix in the vanilla, black rum and powdered sugar until smooth. If desired, mix together brewed coffee and 1 teaspoon black rum. Pierce the top of each cupcake and drizzle about 1 teaspoon of the coffee mixture over the top to give the cupcakes the signature tiramisu texture. Frost the cupcakes using a wilton 2D decorating tip. Sift cocoa powder over each cupcake. Top with chocolate curls and chocolate covered coffee beans. 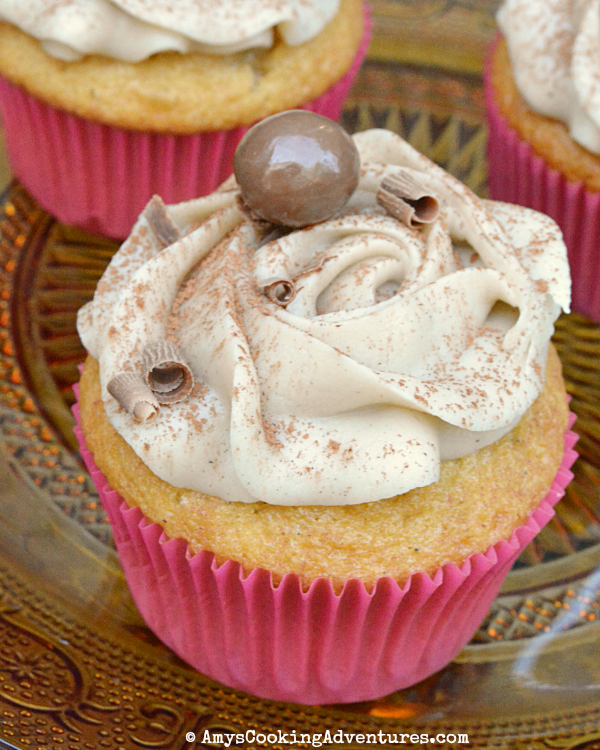 Tiramisu Cupcakes are rich and decadent! Preheat the oven to 350 degrees F and line muffin tins with paper liners. Mix all of the cupcake ingredients in the bowl of a stand mixer until smooth. Divide the batter evenly between the liners and bake for 25-28 minutes. Once the cupcakes are cooled, make the frosting by beating together the cream cheese and butter until very smooth. Mix in the vanilla, black rum and powdered sugar until smooth. If desired, mix together brewed coffee and 1 teaspoon black rum. Pierce the top of each cupcake and drizzle about 1 teaspoon of the coffee mixture over the top to give the cupcakes the signature tiramisu texture. Frost the cupcakes using a wilton 2D decorating tip. Sift cocoa powder over each cupcake.Top with chocolate curls and chocolate covered coffee beans. 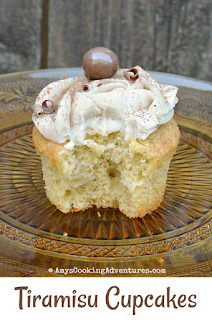 You had me at coffee cream cheese frosting! These are not only gorgeous, they sound AMAZING! Those look crazy good, Amy! Wow. Nice job. And that coffee-infused butter?!? I'm drooling over here. 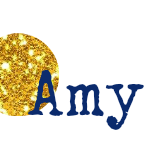 Oh Amy, these sound wonderful!!!! Coffee infused butter! Wow! Cupcakes look wonderful and coffee infused butter does sound interesting. Coffee-infused butter...I did not know that was even possible! The whole cupcake sounds so so delicious and it definitely looks that way :) They are so pretty!